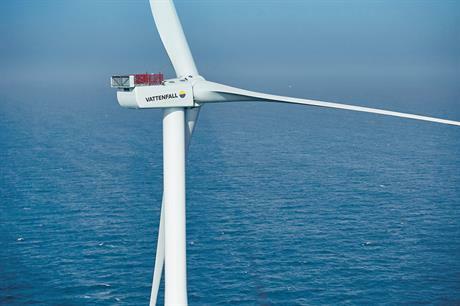 Financing has been completed on the 604.8MW Kriegers Flak offshore wind project in east Denmark, allowing Vattenfall to move ahead to construction. Vattenfall was awarded the licence to build the site in November 2016, following a bid of DKK 372/MWh (€49.90/MWh). The project is set to comprise 72 Siemens Gamesa Renewable Energy (SGRE) 8.0-167 turbines when it is completed, expected by 2022. In July, Vattenfall secured power purchase agreements for the site with pharmaceutical company Novo Nordisk and biotechnology firm Novozymes. Roughly a fifth of the power from the project will be sold directly to the life science companies. "The investment in Kriegers Flak… is a cornerstone in our ambition to enable fossil-free living within one generation — as well as a major step in Denmark’s green transition," said Vattenfall CEO, Magnus Hall. The project will also act as an interconnection between Denmark and Germany via a 400MW link. A cable will connect Kriegers Flak with the 288MW Baltic 2 project in the German Baltic Sea. EnBW's German offshore project is less than 30km from the Danish site. This means Vattenfall's bid price did not include connection costs for the project. Vattenfall is waiting on the result of an appeal process regarding its nearshore sites, won also in 2016, on Denmark’s west coast. The Vesterhav Nord and Syd sites are located just 4km from shore and face local opposition on grounds of visual impact. "We are confident that they are fully in line with the framework awarded to us by the Danish state. However we find it prudent to review the result of the appeals against Vesterhav Syd before taking further steps," said Gunnar Groebler, head of the wind business unit at Vattenfall.